Does swimming with dolphins sound amazing? What about feeding tropical birds from your hand, floating on a winding river, snorkeling with tropical fish and relaxing on a sandy beach? Are you looking for a way to truly unwind and make memories with your family? Then you need to plan a trip to Discovery Cove! 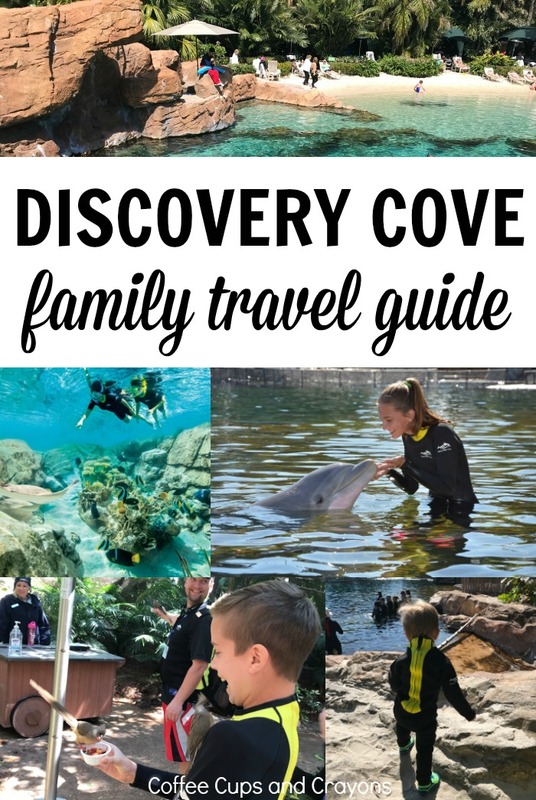 Thank you to Discovery Cove for media tickets to assist in writing this travel guide for families. It is an all-inclusive day resort in Orlando, Florida. You and your family can swim and interact with dolphins, snorkel with tropical fish and so much more! 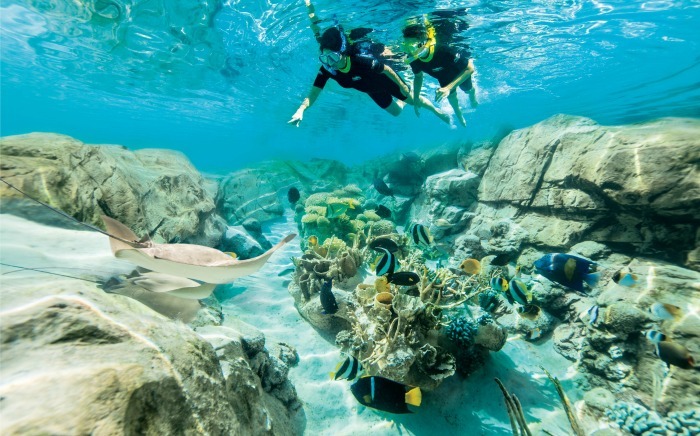 When is the best time to go to Discovery Cove with kids? Whenever works best with your schedule is a great time to go! The temperature and crowd levels don’t have as much of an effect on your day as you may think. We went in March on an unseasonably cold day that felt more like winter in Florida and I was worried we would be too cold, but were totally fine. They have wet suits you wear anytime you are in the water that help keep you comfortable on cooler days. There are also shorter wet suits and temperature regulated water to help keep you cool on warmer days. Throughout the park there are plenty of both shaded and sunny areas to keep you and your family comfortable. Just like anywhere else in the Orlando area the crowds are bigger during the summer and school breaks. 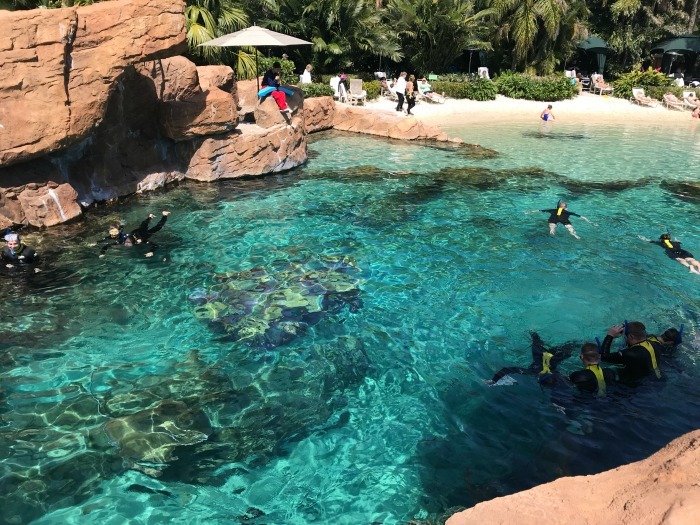 A busy travel time of year won’t ruin your Discovery Cove experience because they limit the number of tickets sold each day, but it may make it more difficult to get tickets on a certain day. Book your date as early as possible if you are traveling during a peak time. What should you wear to Discovery Cove? You should wear a bathing suit with a cover up and water shoes or rubber sandals. Sunglasses or a hat may also be helpful to wear or bring with you. What should you bring with you to Discovery Cove? Almost nothing! The beauty of it being an all-inclusive day resort is that most everything is already there waiting for you to use. They provide you with food, drinks, snacks, towels, wet suits, snorkeling gear and even the animal-safe sunblock you can wear in the park. Adults need to bring an ID and a credit card for any extra purchases you may want. If you are traveling with a baby or toddler you may also want to pack diapers and wipes and swim diapers, but you won’t need a stroller! They have beach jogging strollers for you to use with over sized wheels that make it easier to push around on the sand. What can you do at Discovery Cove? There is so much to keep your family busy at Discovery Cove! What happens at the Dolphin Swim? When you arrive at Discovery Cove in the morning you get your Dolphin Swim time. Your party then arrives at the assigned cabana 15 minutes before your swim to sign waivers, meet the trainers, and watch a short video. From there you wade into the Dolphin Lagoon where you meet your bottlenose dolphin friend for a 30 interactive adventure! 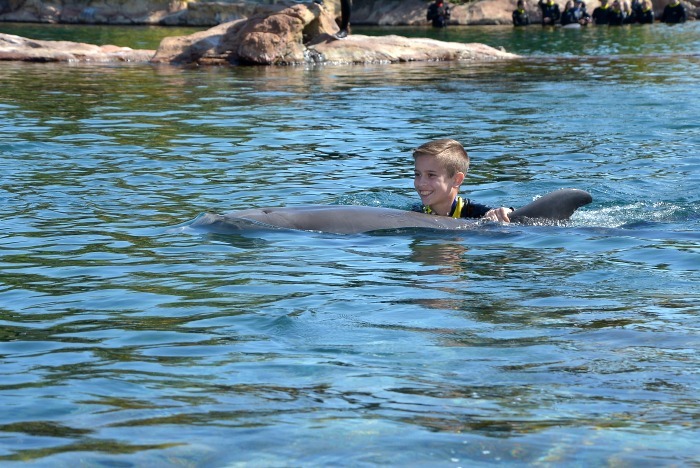 A friendly trainer helps your group become acquainted with your dolphin through hugs, kisses, rubdowns and more. I was so impressed how the interactions are tailored to fit the personality of the dolphins. It really makes for such a cool experience. Before it’s over you get to interact with your dolphin in deeper water for an exciting dorsal fin tow ride back to shore. Such a fun time! They take lots of photos for you with the dolphin that you can purchase at the front of the park. If you have anyone in your group not participating they can stand on the shore and take photos and videos with your camera as well. We had a little one too young to do the swim but he was able to watch us from the sand the whole time. We were even able to get a family shot at the end! What other types of adventures can you purchase? You can do more than just swim with dolphins at Discovery Cove! For an extra fee you can upgrade your dolphin swim package to include other adventures too. Seaventure is an underwater walking tour of The Grand Reef with a dive helmet. You experience one-on-one touches with unique sea life, schools of fish, and velvety rays. You must be 10 or older and no SCUBA certification is required. Shark Swim is a chance for a once in a lifetime experience of swimming with sharks! You must be 10 or older for the shark swim. Ray Feeding is your chance to help expert aquarists early feed our Cownose and Southern Stingrays. You will also have the opportunity to feed thousands of beautiful tropical fish their morning meal before venturing out on a private, guided swim of The Grand Reef. Trainer for a Day is a chance for dolphin lovers to spend even more time with the dolphins as they shadow a trainer and get special behind the scenes access and animal meet and greets. You must be at least 6 years old to participate. Cabanas are a great way to make your day truly relaxing. Complete with table and chairs, chaise lounges, and rolled towels they’re a special place for up to 6 guests to relax when not in the water exploring. This is well worth the money if you are traveling with a very young child or anyone else who may need a place to rest and relax throughout the day. You get unlimited admission to SeaWorld® and Aquatica, SeaWorld’s Waterpark™ in Orlando for 14 consecutive days around the date of your reservation! You can go before or after visiting Discovery Cove by showing them your confirmation letter and photo ID or the personalized ID from Discovery Cove. Parking is always free at Discovery Cove. Not only are breakfast and lunch included with admission, you also get unlimited snacks and beverages! There are lots of options to choose from including snow icees, fruit, hot pretzels and more. Adults 21 and older can enjoy frozen daiquiris, wine, and Anheuser-Busch products for no additional charge. If you have food allergies ask to speak with a supervisor in order to discuss the severity of your allergens and determine a meal that will be safe for you. The aquarists and trainers love to answer questions! One of the best parts of visiting Discovery Cove is just how much you can learn from the people there. Don’t be shy about asking questions–they love to share their knowledge about the animals and sea life they love. Discovery Cove truly gives you a resort experience. It is not like other theme parks where you are rushing around to make sure you get to enjoy as much as you can before you leave. It really is a place you can slow down and enjoy your day knowing everything is taken care of. For more information about Discovery Cove and to book your trip visit their website.